Mikey Garcia shrugged off criticism from his former promoter. Garcia told ESNews in an interview posted on YouTube that he thinks Top Rank’s Todd duBoef disputing Garcia is “a big name” in boxing and other comments were the byproduct of Garcia ending his promotional partnership with Top Rank last year. 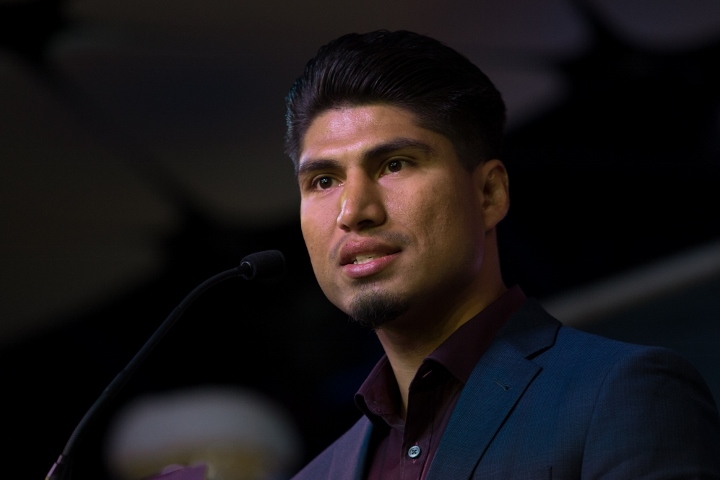 DuBoef, Top Rank’s president, said during a conference call Monday that he wasn’t overly impressed with Garcia’s convincing victory over Adrien Broner on Saturday night and questioned whether Garcia actually is willing to take on the biggest challenges available (https://www.boxingscene.com/top-ranks-duboef-rips-mikey-garcia-open-garcia-lomachenko--119049). DuBoef’s criticism of Garcia came in response to a reporter’s question about Vasyl Lomachenko facing Garcia if he defeats Colombia’s Miguel Marriaga on Saturday night in Los Angeles (ESPN). “He wasn’t impressed,” Garcia told ESNews regarding duBoef’s comments. “He wasn’t happy. The fans are not clamoring [for] Mikey Garcia. I’m not a big name yet or something. I mean, he’s not my promoter, so I understand why he wouldn’t mention me. But look, if all the media keeps bringing my name up with their fighters, that should tell them something, you know? Garcia (37-0, 30 KOs), the WBC lightweight champion, was referring to Lomachenko defending his WBO super featherweight title against Marriaga. Ukraine’s Lomachenko (8-1, 6 KOs) – one of the best boxers, pound-for-pound in the sport – is heavily favored to defeat Colombia’s Marriaga (25-2, 21 KOs), who in his last fight lost a unanimous decision to WBO featherweight champion Oscar Valdez (22-0, 19 KOs) on April 22 in Carson, California. The 29-year-old Garcia would like to fight Lomachenko at 135 pounds or WBC/WBO super lightweight champion Terence Crawford at 140 pounds. Bob Arum’s Top Rank promotes Lomachenko and Crawford (31-0, 22 KOs). Garcia senses that Top Rank wouldn’t be willing to make those fights due to their contentious history, but duBoef said during the conference call that Top Rank would be open to those negotiations. “We’re going after the bigger challenges, big names that make sense,” Garcia said. “If they want it, like his fighters, if they want it, because I know a fighter will fight anybody. But it’s not the fighter that makes the call – it’s the promoter and manager. And Bob Arum, Top Rank, Todd duBoef, they’re the ones handling those decisions, not the fighters. A smiling Garcia also took issue with duBoef’s contention that Garcia wouldn’t agree to fight then-unbeaten Yuriorkis Gamboa in 2014. “Well, he’s gonna have to bring [up] the Gamboa topic to try and talk me down,” Garcia said. “I’m not his fighter, so he can’t speak nicely. Maybe they’re still a little upset that we left. But, you know, the fight with Gamboa never happened because it only came with another extension onto my contract. And I wasn’t willing to extend any terms on the contract. We wont ever see Garcia-Crawford. Just like Bob didnt make Pac-Crawford or Pac-Khan. but gave us that turd Pac-Horn. Now he is talking about making Horn-Crawford. Thanks arum.